Conversely, on the target, the adb daemon (named adbd) will manage the requests from the host and communicate locally with the native user-space, with the Java user-space and the kernel. your device is not spatially close to the host (pc) therefore is not possible to leverage the usb connection. you don’t have a free usb port neither a usb hub at hand. So, how to connect the adb over wifi? The following simple steps are needed in order to achieve that. These commands have been tested on a Ltouch FW Android multi-touch panel, an HMI designed for home and industrial automation projects. However, this procedure can be extended as for any other Android-based device. The ip address assigned is the one that corresponds to the “UP” network interface (i.e., running), different from localhost (127.0.0.1). Now, connect your device to the host pc using the usb cable. Tell the adb which is the ip address to connect to. The ip provided refers to the one found on the first step. and you’ll get the list of connected devices and in particular the ip address and port. Now your adb over wifi is perfectly working! For more information, take a look at the Google ADB web page. 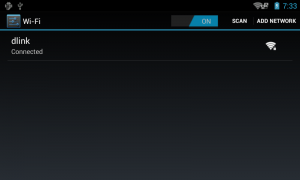 This entry was posted in android and tagged adb, devices, ethernet, remote, wifi, wlan by biemadmin2012. Bookmark the permalink.